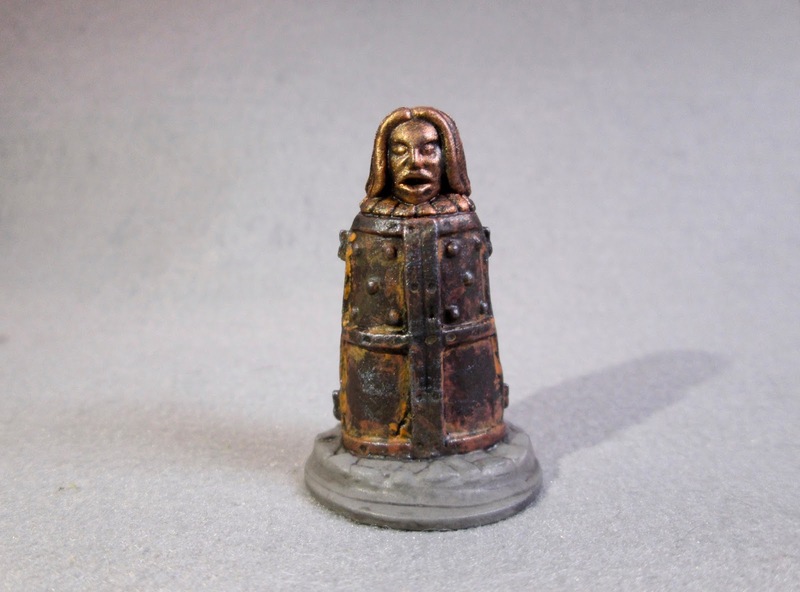 Torture Equipment: Iron Maiden: Bones 3 Figure | H.A.W.K.S. With all the Christmas stuff to get done around the house, I picked something quick and easy to paint, so chose the Iron Maiden from the Bones 3 Torture Chamber set. I prepped the figure in the usual way; soaking it in a dish of water with a couple drops of dish-soap added, then giving it a light scrub with a soft toothbrush, and then rinsing and drying it. I then glued the figure to a black-primed 1.“ fender washer with Aleene’s Tacky glue, and then glued the washer-mounted figure to a tongue depressor with a couple drops of the Elmer’s glue. 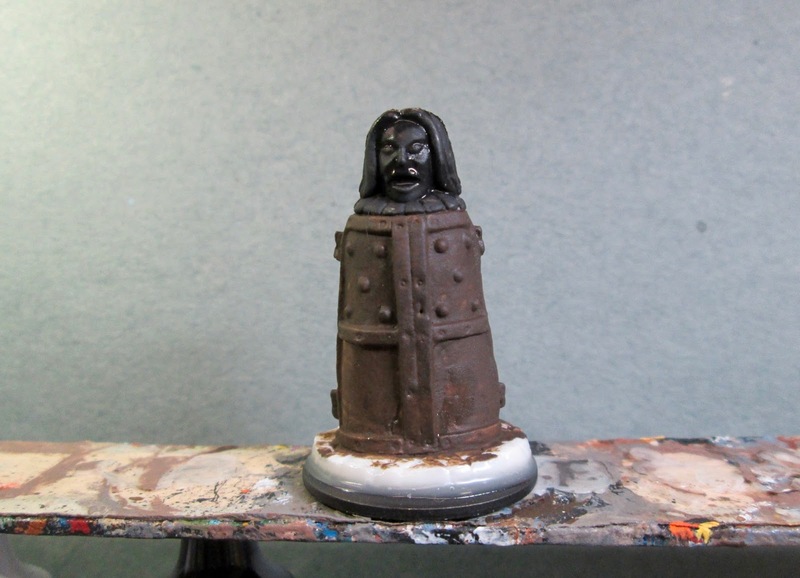 I then drybrushed the head with Ceramcoat “Bronze, and when that was dry, I gave the entire piece a wash with Citadel "Nuln Oil” wash. When the wash was dry, I added some rust effects to the main body with Crafter’s Edition “Spice Brown”, and then Accent “Golden Oxide”. 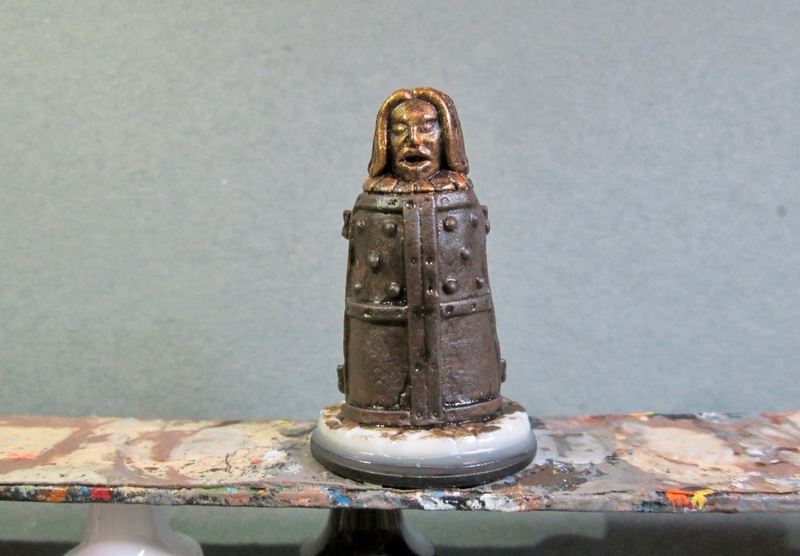 Next, when the wash was dry, I lightly drybrushed the main body with Folk Art Metallics “Gunmetal Grey”. 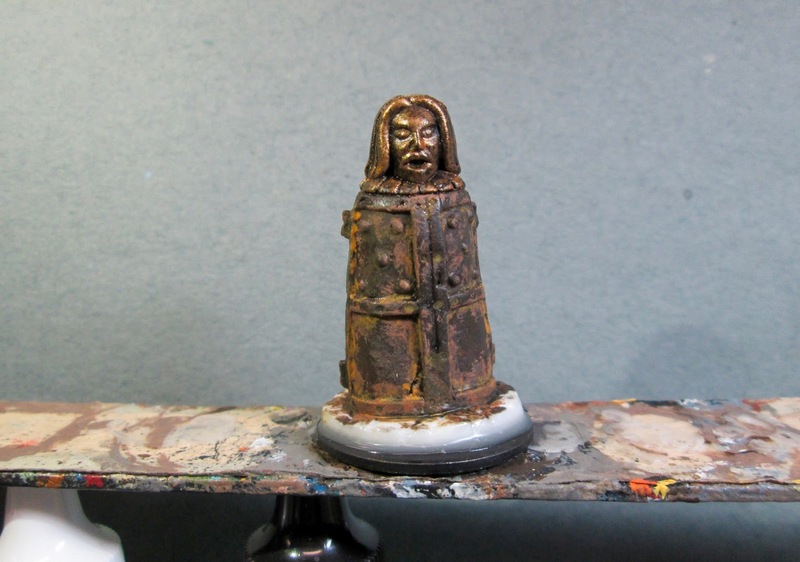 After that I drybrushed some highlights on the head with Ceramcoat “14K Gold”. 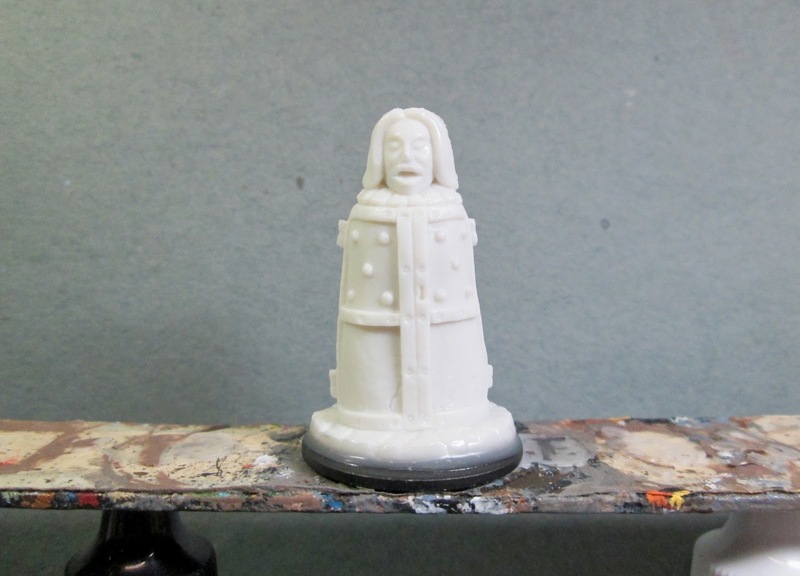 I then painted the base with Americana “Neutral Grey”, and when that was dry, gave the stones on the figure’s base a light wash using a wet brush with the “Nuln Oil”. When the wash was dry, I did a quick highlight on the stones with the base “Neutral Grey”. I let the figure dry overnight and the next day I gave it a coat of Americana “DuraClear Matte” varnish. Then, another overnight dry, and I sprayed it with Testor’s Dullcote". I’m pretty happy with how this turned out. I’m particularly pleased with how the rusty metal ended up looking. Since next Monday is Christmas I won’t be posting a figure. Please tune in again on New Year’s Day, when I hope (fingers crossed!) to be bale to post my first figure of 2018. Looks great! I’ve been looking for some rust techniques recently, and you did a really nice job. 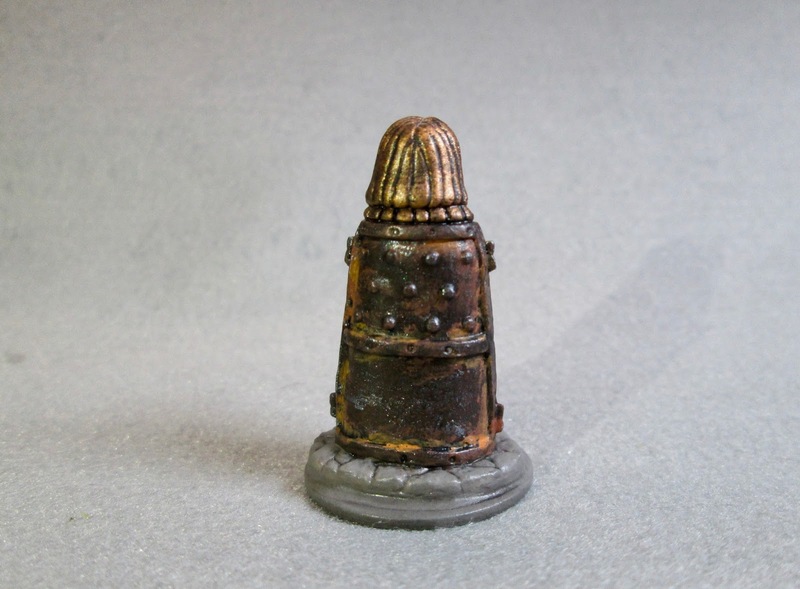 Did you use a sponge to apply the rust colors or a brush? Thanks! I used an old brush and just dabbed and smeared the paint around. Nice job Chris, and Merry Christmas!